Abstract : Digital technology has been completely integrated into our daily lives, yet the potential of technology to improve its users’ life satisfaction is still largely untapped. Mindfulness, the act of paying a deliberate and non-judgmental attention to the present moment, has been shown to have a positive impact on a person’s health and subjective well-being – commonly called “happiness”. Based on an iterative process with meditation teachers and practitioners, we designed a new tool to support mindfulness practices. 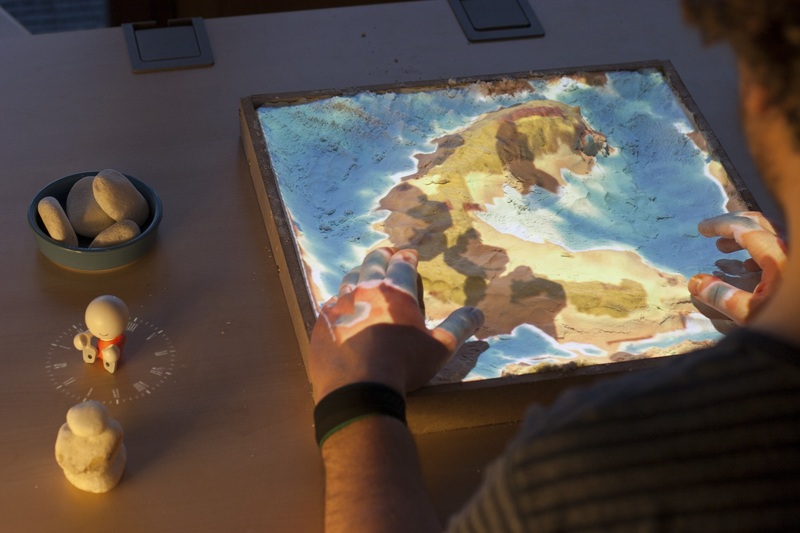 This tool takes the shape of an augmented sandbox, designed to inspire the user’s self-motivation and curiosity. By shaping the sand, the user creates a living miniature world that is projected back onto the sand. The natural elements of the garden are connected to real-time physiological measurements, such as breathing, helping the user to stay focused on the body. Moreover, using a Virtual Reality headset, they can travel inside their garden for a dedicated meditation session. Preliminary results seem to indicate that the system is well suited for mindfulness and induces a calm and mindful state on the user. The meditation teachers envisioned the use of Inner Garden in their practice.